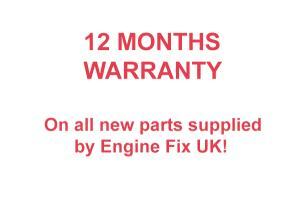 Engine Fix UK supply a wide range of pistons for diesel engines covering both vintage, classic and modern day engines. In the cylinder of an engine, the energy of the fuel is rapidly converted into heat and pressure during the combustion cycle, the heat and pressure increase rapidly within a very short period of time. The piston as the moving part of the combustion chamber, has the task of converting the released energy into mechanical power. 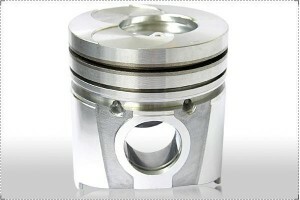 The basic structure of a piston is a hollow cylinder closed on one side, with the segments piston crown with ring belt, pin boss and skirt. 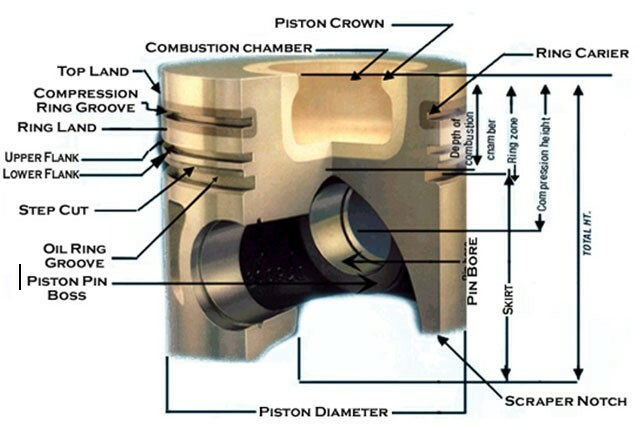 The piston crown transfers the gas forces resulting from the combustion of the fuel-air mixture via the pin boss, piston pin and the connecting rod to the crankshaft. As the moving and force-transmitting part, the piston together with the piston rings must reliably seal the combustion chamber against passage of gases and the penetration of lubricating oil under all load conditions. This can only be achieved if a hydrodynamic lubricating film is present at all times between the piston rings, skirt and the cylinder bore. The static nature of the piston at the two dead centre points where the lubricating film isn’t fully functional is particularly problematical. 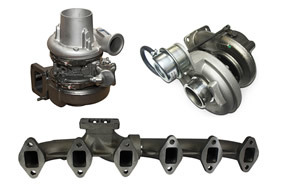 All of these requirements must be carefully considered for each engine type and quite often the requirements can be contradictory, the optimum solution can be quite different for each individual engine, this is particularly the case for more modern day engines. Mechanical loads on the piston in a diesel engines can be typically between 8.0-10.0 MPa for a naturally aspirated engine and 14.0-24.0 MPa for a turbocharged engine, Gas Temperatures in the combustion chamber reach 2000 deg C, exhaust 600-900 deg C such that the piston crown/bowl rim can see temperatures up to 400 deg C, the piston skirt will see up to 180 degC and the pin boss up to 260 deg C.
The temperatures experienced in the first piston ring groove are important in terms of oil coking, if the temperature is excessive the piston rings tend to “lock up” or coking due to residue build up in the piston ring groove. A primary function of the piston and its ring set is to seal off the pressurised combustion chamber from the crankcase, due to inherent clearance between the piston and the cylinder, bow-by (combustion gases) can enter the crankcase during the engine cycle. 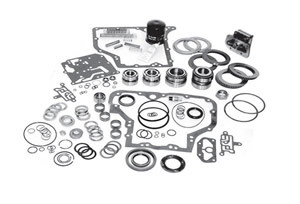 In addition to the impaired energy efficiency the escaping leakage gas poses a threat to the piston/piston ring lubrication due to contamination and displacement of lubricating film and consequential oil coking. Sealing against blow-by is mainly facilitated by the first piston ring, which is the compression ring, for naturally aspirated engines the quantity of blow-by is normally a maximum of 1%, whereas for turbocharged engines it is 1.5% of the theoretical air intake. The most common type of piston utilised in Diesel engines is the Ring carrier piston, these pistons have been in use since 1931, the first and sometimes the second piston ring are guided in a ring carrier that is securely joined to the piston base material by metallic bonding. This ring carrier is often known as the Alfin Ring. The inserts are manufactured into pistons to reduce ring groove wear in diesel engines and to increase engine and piston life. 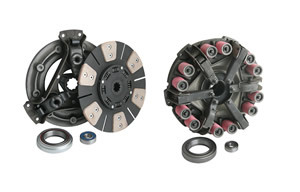 Contrary to popular belief of many, these inserts are not there to strengthen the piston. In reality, as they present a discontinuity in the structure of the piston, they are a potential point of weakness. 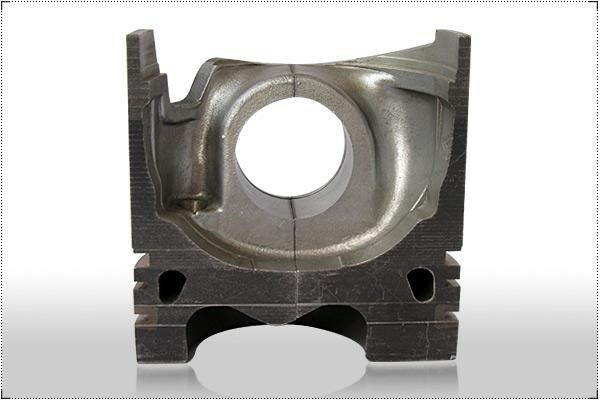 Typically Alfin inserts are made of Ni-Resist cast iron, which is a nickel alloyed cast iron with a thermal expansion co-efficient similar to piston grade aluminium. Whilst many piston manufacturers use the shape of the insert to help lock it into the casting, the real strength of the insert is the result of a molecular/atomic bond between the insert and the piston materials. Aluminium has a very marked affinity for iron and so before the Alfin insert is fitted into the piston mould, and the casting poured, the insert is ‘soaked’ in a molten aluminium bath for some considerable time, this enables the insert to come up to temperature and gives time for the molecular interaction between the iron and aluminium molecules. After Dye penetrate crack testing, it is acceptable to have the radial length of all separations, located on the upper and lower edges of the insert, to be confined within 20% of the bore circumference. The Alfin material is particularly resistant to frictional and impact wear which is needed for the first piston ring groove due to diesel engine high operating temperatures and pressure. 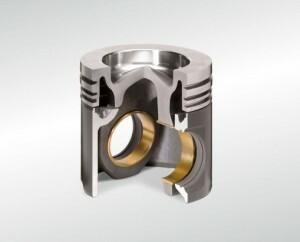 Many more modern pistons have the top ring groove and the alfin insert very close to the piston crown to reduce the dead space above the first ring as a means to reduce emissions. This presents problems with the integrity of the Alfin ring bond, so some manufacturers use ceramic fibre grove inserts. The ceramic is a very-fine ‘honeycomb’ structure with a 6% density, these are placed into the piston mould at elevated temperature and the molten piston alloy is injected into the mould under high pressure using a process called ‘squeeze casting’ or liquid forged casting’, thus the molten alloy fully impregnates the ceramic insert such that the two become integral making it impossible to separate or de-bond them. This is an expensive process which is popular with OE piston manufacturers. 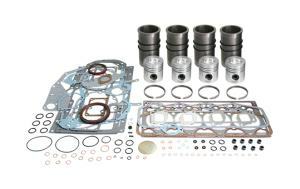 These are incorporated into the piston in order to cool the area local to the combustion chamber, the cooling oil is generally fed through fixed ports in the crankcase. 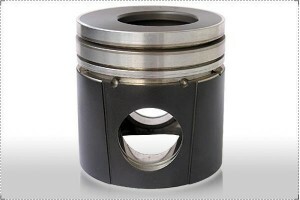 This is a new type of piston which significantly improves the cooling of the first piston ring as well as the combustion chamber, the intensive cooling of this ring grove make it possible to replace double keystone rings with a more straight forward rectangular ring. These type of pistons are used in highly loaded commercial vehicle engines, in this design there are two parts, the piston crown and piston skirt, which are connected through the piston pin, the piston crown is made of forged steel whilst the skirt is made of aluminium. Tin is a soft deformable material so serves as a run-in aid on the skirt of the pistons especially for cold starts, the coating is just 1 to 2 microns thick and is used when paired with cast iron cylinder liners in older types of engine. After long periods of running thermal and mechanical overloads can lead to bowl rim cracks and crown cracks, in order to prevent this, hard oxides are used 50 to 80 microns in thickness. This coating is not applied externally but results from converting the base material at the surface. Metal phosphates form crystalline or amorphous coatings that have good oil bonding, high adhesive strength and good deformability characteristics. Phosphates provide effective protection against seizing and scuffing. Engine Fix UK offer a comprehensive range of pistons for agricultural, construction, truck, marine and industrial applications. We recommend that all diesel engine pistons must be fitted to the engine block to check piston protrusion heights before engine assembly. Incorrect protrusion can be corrected by decking the block, piston crown, resizing the conrod length or fitting graded head gaskets. When changing out pistons it is important if you are replacing just one or two pistons you need to inform us of the piston weight so that we can ensure the pistons we provide are of a similar weight to your original pistons ensuring that the engine balance is maintained.